Servers | KGS | Another 9p on KGS? Erinys, 9-dan is a new star on KGS. He played 13 games today against 6d-9d players (on handicap) and lost only one (to bookish, 7d on 2 stones). He is still undefeated in even games! Sorry,but I don't know his real name. 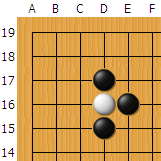 I checked the unusual fuseki he played against bin7674 in Bigo Assistant and found only one pro vs pro example: Aragaki (b) vs Hane Naoki. So, maybe Erinys is Aragaki, 9p, but still there are not enough information to say so. It seems most likely to me that it's rapyuta, giving his playing style, immense strength and playing tens of blitz games in row. And it's quite common knowledge that rapyuta probably at least used to be a Kansai ki-in insei; it's said that macisajt knew him personally (and in the early days of rapyuta, they played games most frequently between each other). probably mr chi tchat and mr go sipp. but to be honest i love to read this page. Who are other 9ps on KGS??? ?